With major acquisitions of organic baby food and fresh carrot companies, the canned soup company is trying to become a strong advocate for fresh food and ingredient transparency. For decades, Campbell’s has been an icon of traditional American processed food. Andy Warhol celebrated the company’s soup cans as a symbol of manufactured pop culture in the early 1960s. So the last thing you would expect is for the brand to be associated with real food. But that’s exactly the transformation that the company has brought about under the leadership of Denise Morrison. Two years into her tenure as CEO, Morrison assembled a team from across the organization, not just comprised of executives, to understand the role of their products in people’s lives. It was an eye-opening exercise for the company. And Morrison says it helped them discover that they were in the business of creating, “Real food that matters for life’s moments,” as they worked with a team of chefs to make sure that their products were both safe and delicious. The statement became their purpose as a company. It is at the core how Morrison makes decisions and runs the company. Morrison recalls that her dinner table growing up with her sister was “like a focus group.” Her father, an executive at AT&T, would bring home products to get his daughters’ input and ideas, constantly encouraging them to be curious and voracious learners. Not only did he make them read a book a week but on top of their schoolwork he required them to do a “book report for him, either oral or written, our choice,” she says. Morrison’s lifelong quest for knowledge now expresses itself in her push for greater transparency about the ingredients used to make Campbell’s products. Under her leadership, the company has removed artificial ingredients and colors from their products. And last year, the company went further, becoming the first major food company to announce that it would label its products to disclose the presence of controversial genetically modified ingredients (GMOs) like corn, soy, and sugar beets. And to make it easier for consumers to actually track what’s in the Campbell’s products they buy, the company launched a new website called “What’s In My Food”. The bold move involved breaking with peers in the food industry, while supporting standards for higher transparency that only a few states in America have been pushing for. 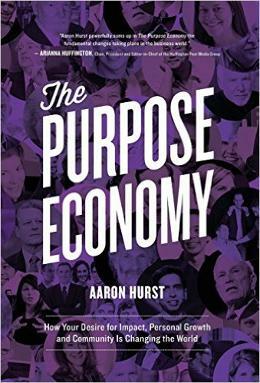 The expanded and updated version of Aaron Hurst’s book, The Purpose Economy, is available now. “I’ve always believed consumers have a right to know what’s in their food. The single most important ingredient in the recipe for success is transparency because transparency builds trust,” she says. From Morrison’s perspective, this requirement directly flows from the company’s purpose-driven by its commitment to real food. As part of helping families make healthy choices, Morrison believes it’s important for the company to support the communities where their employees live and work. In 2011 the company launched the Healthy Communities initiative in Camden, New Jersey, where the company is headquartered, to fund school gardens, mobile food pantries, nutrition education and cooking classes through a unique partnership (with the city, the state university and the Robert Wood Johnson Foundation, among others) that takes a holistic approach to building healthy communities. The company’s comprehensive approach to building healthy communities experience has “been so galvanizing,” Morrison adds, that they’ve expanded programs to Detroit, Norwalk, Connecticut, and other cities where they operate. Armed with their newly defined purpose and a quest to provide affordable food made with transparency about their ingredients, Morrison has discovered new ways to grow their business. The company recently purchased Bolthouse Farm, one of the largest suppliers of fresh carrots in the U.S. Morrison has continued the company’s purpose-driven buying spree by acquiring Garden Fresh Gourmet, a company with a line of fresh salsa and fresh hummus. As a result, the king of processed food has now become a major player in the fresh food business, creating “a billion dollar fresh food platform for Campbell’s,” as Morrison points out. “The magic of this is that purpose is uniting the core businesses that we’ve had for 148 years, and the new businesses that we’ve bought in the last six years against a common goal for why we do what we do,” she says. Perhaps this more than anything has been Morrison’s key to success. She is constantly digging deeper to gain insights about her customers and uncover trends that can fuel her company. “I purposely put myself in new, stressful situations so that I can continuously learn,” she says. This article is part of a series of articles by Aaron Hurst exploring how leaders find purpose and meaning in their jobs. This fall, Hurst’s company, Imperative, released a global survey of the role of purpose at work, in partnership with LinkedIn Talent Solutions, which found that those who are intrinsically motivated to find purpose in their jobs consistently outperform their colleagues and experience greater levels of job satisfaction and well-being, regardless of country, gender, or ethnicity. They are also 50% more likely to be leaders. This series will profile those leaders, and how they connect with what’s meaningful to them in their role and the organizations they lead.